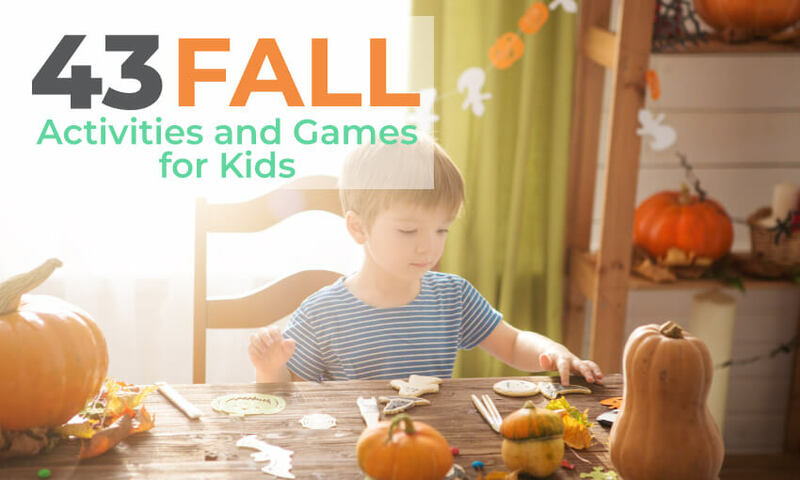 Here is a list of fun fall activities and games for kids. The kids are back in school, the leaves are turning colors, and Halloween is approaching. These games and activities are a great way to bring in the fall season. They are sure to bring hours of fun and laughter. 4. Write the “number 1” on the backs of the white pumpkins. 5. Write the “number 5” on the backs of the yellow pumpkins. 6. Write the “number 10” on the backs of the orange pumpkins. Players add up the numbers on their collected pumpkins. The player with the most points wins! This can also be played in teams. – While the kids are out of the room – hide paper or small gourd pumpkins around the room. Challenge kids to find them all! When they have found all pumpkins you can serve a special snack or give each child a ‘goodie’. Carve out a pumpkin (Do NOT make it a Jack-O-Lantern); line the inside with plastic or aluminum foil. Make the top opening large. Option is to use small plastic pumpkins which are quicker and not messy! How many words can the kids come up with letters in the word ‘PUMPKIN’ ? This can be an individual challenge, or two or three kids teamed together. Line up three large pumpkins with stems, to form a ring toss. Use embroidery hoops or make hoops with rope and duct tape. Mark a throwing line on the floor and take turns trying to ring a pumpkin stem. Variation: Try to ring an entire large pumpkin with a hula hoop! NOT A GAME BUT WONDERFUL FOR YOUNG KIDS AND THE YOUNG AT HEART! This is like a regular cake walk except instead of numbers, place pictures of several fall items on the floor for the children to walk; call out the names of the items instead of numbers. Award the child that lands on the picture of a pumpkin—a small/miniature pumpkin! Use fall themed music such as “Turkey In The Straw” or “Jimmy Cracked Corn”. 21. GUESS THE PUMPKIN’S WEIGHT! 22. GROWING IN A PUMPKIN! Cut the top off the pumpkin and and clean out the seeds. Fill the pumpkin with cotton and spray with water. Sprinkle the seeds on the batting. Keep the batting moist, and seeds will sprout in about 2 weeks or sooner….just in time for Halloween! You can quickly make pumpkin seeds in your microwave. The shells are edible — and a good source of fiber. You can also use this method with other seeds such as acorn squash and butternut squash. 1 cup pumpkin seeds, 1 Tbsp. Olive oil or butter, Salt, seasoned salt, garlic /onion powder or other seasonings to your choice. Rinse pumpkin seeds. Remove all the pulp. Drain the seeds and discard the pulp. Spread out on paper towel on a cookie sheet and dry them over-night. Place butter or Olive Oil l in a microwave-safe, baking dish. Microwave on high about 7 to 8 minutes or until seeds are toasted a light golden color. Be sure to stir every 2 minutes as they are cooking. When done, sprinkle with your choice of seasonings. Coat evenly. Cool them before eating or storing. They can be stored in an airtight container at room temperature up to 3 months or refrigerate up to 1 year. If you like your toasted pumpkin seeds extra-salty, soak them overnight in a solution of 1/4 cup salt to 2 cups of water. Dry an additional day, and follow the above directions. 24. DOES A PUMPKIN SINK OR FLOAT? Fill a large clear storage container or aquarium with water. (If the weather is warm, you can do it outside). Have children make predictions of what will happen and graph the predictions. Do the experiments to determine if they were right or not. Make it interesting and get a few pumpkin sizes. Talk about why they float… If older kids know the answers… have them run the activity. The pumpkin (and watermelon) will float because its mass is less than the mass of water it displaces. This is due primarily because the inside of the pumpkin and melon are hollow. It is mostly air, which has a much lower mass than water. Place each pumpkin half in a plastic bag that is mostly closed (the environment needs to be moist, yet allow some fresh air to enter). Set one bag in a sunny spot, one in a shady spot, one in the refrigerator, and one in a location of the students’ choosing. Ask kids to predict which pumpkin will grow the most mold over the course of the experiment. Set aside time each day for students to examine the pumpkin halves and record their observations. Then ask students: Where is the best place to keep a jack-o-lantern in order to keep it from spoiling? After doing the above—here is a TIP FOR KEEPING THOSE CARVED-OUT PUMPKINS FRESH! Some say that coating the inside of the emptied/carved pumpkin with petroleum jelly (Vaseline) should help preserve and keep the pumpkin from shriveling/getting moldy. Trying various methods myself–the pumpkins that stayed freshest the longest were those sprayed with “Clorox Cleanup” (or a mixture of bleach and water). Spray the bleach and water inside of the pumpkin daily. Killing off mold spores with a bleach solution helps preserve the pumpkin. If your pumpkin starts to look as if it needs rehydration– (wilting or caving in)– fill a large container with cold water and 2 or 3 tablespoons of bleach. Good results should be achieved when soaked overnight. Cooking and making playdough is also science. Liquid that turn to a solid is science. See the Pumpkin Play Dough recipes in the below ‘Arts and Crafts’ section of this page. 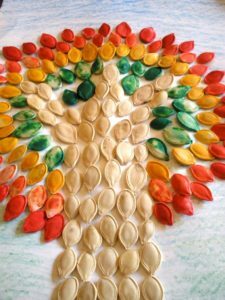 From Our Little Nature Nest comes this wonderful pumpkin seed mosaic art! Jenn from the site explains it best! She says…”You can use any large seeds like those from a pie pumpkin, or hard squash that you may have from cooking this fall. Combine dry ingredients in a non-stick pan. Add oil, water, food coloring and stir until smooth. Cook and stir over medium heat until all lumps disappear. Knead the dough on a floured surface until it’s smooth. Dough will keep in a plastic bag for about a week…and it smells wonderful! Of course you can purchase the spice–but you can also make your own! In a small bowl, combine all ingredients and mix well. Store in air tight container. Cut the top off of a small pumpkin. Clean and carve the pumpkin. Sprinkle pumpkin pie spice on the inside of the lid and cut a small hole in the top to make a chimney. Light a votive candle and set inside. Replace the lid. Results are a pumpkin pie scented votive! 1. Starting with a lunch size paper bag– crumble-up some paper and stuff the lunch bag. 2. Tie the top with string leaving about 2 inches of space at top. 3. Paint the bottom portion with orange tempera paint and the top brown (for the stem). Copy a leaf pattern on green paper, felt or foam — cut it out–glue or staple it to base of stem. Optional but nice: Wrap green or brown pipe cleaners around the pumpkin stem for vines. (Give the pipe cleaner vine a curly look by spiraling it around a pencil and then twisting it onto the stem. You can make a jack-o-lantern by painting or drawing a face on your orange paper bag. I prefer to make these by first painting the paper bag orange. Have the kids open the bag and place it on their hand (like a puppet) They will be able to then paint all sides. Leave the top 1- to 2-inches of the bag brown. Buy several small, real pumpkins. Have children dip the pumpkin halves into paint to make prints. Peel the paper wrapping off an orange Crayon. Place a textured item such as plastic bubble wrap or a dish mat UNDER a large piece of white construction paper. Rub with the side of the crayon over the entire paper to create a pumpkin’s bumpy surface. Continue with your project. Use a serrated knife to slice the end off a Styrofoam ball so it will stand flat without rolling. Wrap the ball with fabric, gathering the ends at the top of the ball. Secure fabric with a rubber band. Twist two pipe cleaners together. Wrap it around the rubber banded fabric and twist to keep in place. Twirl ends around a pencil. Finish off the pumpkin with a raffia bow. Would be cute grouped together in a bowl on a tray…and…each one only takes about 10 minutes to make! Source: Cindy of Pittsburg PA.
fold into an accordion about 3 inches square. When all folded– cut the shape of a pumpkin leaving the side with the fold NOT cut. When you open you will have a chain of pumpkins. 3. Paint the leaves, and flowers/fruit of the plant above the ground level. To go along with the art project! 1. Leafy vines grow from pumpkin seeds. 2. Yellow-orange flowers bloom on the pumpkin vine, then wither. 3. The flowers’ ovaries (at the base of the flower) swell and become tiny green pumpkins. 5. In four months after planting, they’re ready to harvest. Can you take your kids on a field trip pumpkin patch? Read books about ‘Growing Pumpkins’ and ‘Pumpkin Patches’ before the trip. Have children each pick out a pumpkin to take back. (If budgets are tight-have parents pay for their child’s pumpkin) While at the patch–observe how the pumpkin are growing on the vine. Look at variations in color, size, shape, quality and weight! Children can take their pumpkins home–or decorate them with you. Put out paint, yarn for hair, google eyes, and other decorating materials. How creative can they get?! This is a party snack and craft in one…wonderful for a dessert table! I purchased a Styrofom pumpkin and simply inserted the sucker sticks into the pumpkin. Result is an extremely quick and cute sucker-holder decoration! And shake my vine like that. Once they started rolling, they couldn’t keep still. How many pumpkins left? Now there are four. I hear them clumping, I hear them thumping. How many pumpkins left? Now there are three. Watch them tumble and roll so fast. How many pumpkins left? Now there are two. Will they ever slow down and stop at last? How many pumpkins left? Now there is one. Now it’s stopped rolling, look and see. Now how many pumpkins are rolling in the sun? Did you guess zero? You’re right, there are none. I’m pulling on a pumpkin on a vine. It’s so big and fat and fine. A pumpkin that grows on a vine? A bumpy one, a squashed one. That grows on a vine? This one has a scary face! Pumpkins are a fruit NOT vegtables. Pumpkins range in sizes from less than a pound to over 1,000 pounds. Pumpkins can vary in color from white or green to yellow to orange. Pumpkins are an ingredient in pies, breads, soups, and other foods. Carved pumpkins only last about four days but uncut pumpkins, keptin a cool place, remain firm forseveral months. 38. A FEW PUMPKIN DECORATING IDEAS! 39. YOUR ADDRESS–THE PUMPKIN WAY! Select one pumpkin per house number and cut a hole in the top of each. Clean pumpkins out–saving the tops–wipe exteriors dry.Center paper stencil number (these are 5 inches tall) on the first pumpkin and adhere with painter’s tape. With a marker, trace the stencil outline, then carefully carve just outside the line with a small handsaw or heavy-duty craft knife.Repeat for each number. Arrange a few tea lights inside each pumpkin, then line up or stack in proper order.Replace top on the highest pumpkin.Illuminate tea lights using a long-handled lighter through the holes. THE FAST WAY…You wouldn’t be able to insert tea lights–but a similar effect could be achieved by painting on the numbers! Thoroughly clean/carve out a small to medium-sized, round pumpkin. Line the interior with tin foil or saran wrap. Place a block of florist’s foam inside the scooped pumpkin; place an assortment of harvest-themed artificial berries and flowers, available at arts and crafts stores, into the foam block. Abundantly fill the foam block so that you cannot see the opening of the pumpkin. This makes a festive Fall and Thanksgiving centerpiece! As you see, it also makes a nice candle holder. Use hot glue to secure the Styrofoam into the pot. Make the “tree.” Sharpen the end of the dowel or branch (trimming it to size if necessary). Push it into the bottom of the pumpkin. Push the other end of the dowel into the Styrofoam. Hot-glue the dowel to secure if necessary. Add the finishing touches. Spread dried beans or peas over the top of the Styrofoam, gluing if desired. Using raffia, tie a bow around the dowel just below the pumpkin. TIPS: you can replace the miniature pumpkins with small gourds. If you want your topiary to last for more than two weeks, use artificial vegetables or fruits. Visit the Autumn Decorating and Center Piece page for some wonderful ideas…great for ‘September to Thanksgiving’! Some books included in this section make reference to Jack-o-Lanterns and/or Halloween. If you do not wish to familiarize your children or students with this holiday, please check the Amazon.com reviews before purchasing any of the following books. In the course of one year, a jack-o-lantern, discarded after Halloween, decomposes in the backyard and eventurally grows new pumpkins from its seeds. In a Pumpkin Shell: Over 20 Pumpkin Projects for Kids. by Jennifer Gillis BProvides instructions for a variety of projects involving pumpkins, such as growing them, using them for crafts, and using them in some great recipes. A sister and brother plant and tend their own pumpkin patch so they will have jack-o-lanterns for harvest time. by Margaret McNamara Katy find what she thinks is the perfect pumpkin on a class field trip to a pumpkin patch, but after her classmates tease her about how small it is, it is up to Katy’s father to show her how perfect her pumpkin can be. by Joan Holub Children plant pumpkin seeds, water and weed the garden patch, watch the pumpkins grow, pick them, and enjoy them in various ways. by Deanna Cook Provides instructions for fifty projects and activities involving pumpkins, including growing them, using them in recipes, and making things out of them. by Gail Gibbons Describes how pumpkins come in different shapes and sizes, how they grow, and their traditional uses and cultural signigicance. In simple language, a young girl tells of her family’s trip to a farm where they picked apples and pumpkins. The family samples fresh apple cider and returns home to carve the pumpkin into a Jack-o-Lantern, just in time for Halloween. Looking for books about Jack-O-Lanterns and Halloween? Be sure to check out the Autumn Book List Category–fantastic lists which include books about Jack-O-Lanterns, Scary, and Halloween!